Towards the end of World War II, Adolf Hitler sought refuge in his bunker in Berlin known as the Führerbunker. For four months he lived in the bunker with his lover Eva Braun as well as some of his closest officers. It is also where Hitler, Eva, and others took their own lives once the Russians had overrun Berlin. Two weeks after the Soviets discovered the bunker, photographer William Vandivert became the first Westerner to step foot inside the shelter. See the photographs he took and the state of Hitler’s final residence and place of death days after the conclusion of World War II. The layout of the bunker is more complex than you may think. The Führerbunker or “shelter for the leader” was an air-raid shelter located near the Reich Chancellery in Berlin, Germany. It was built as part of a vast underground bunker complex. The subterranean complex was constructed in two phases between 1936 and 1944. It was the last of the Führer Headquarters that was used by Adolf Hitler during World War II. On January 16, 1945, Hitler moved into the Führerbunker where it became the central hub of the Nazi regime until the last week of World War II. It was also in the Führerbunker that Hitler married Eva Braun in April 1945, just 40 hours before they took their own lives. Hitler’s accommodations inside of the Führerbunker portion of the bunker were decorated to his liking and designed to feel as much like a home as possible. He had expensive furniture moved in from the Chancellery along with personal touches like sentimental decorations and oil paintings. After descending into the Führerbunker, there was a hallway with multiple rooms on both sides. On the right side, the rooms were full of switchboards, generators, and ventilators. On the left, there were bedrooms and Hitler’s office which contained his desk and a portrait of one of his heroes, Frederick the Great. Hitler officially moved into the Führerbunker on January 16, 1945, and decided to remain there during the last major siege of the war. During that time, he continued to give orders to his associates such as Hermann Goering and Heinrich Himmler. 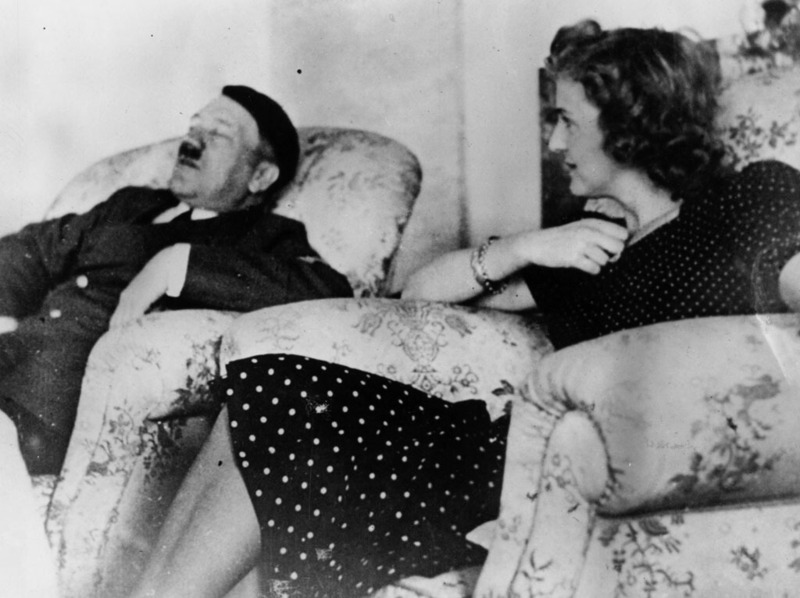 By April, it was clear that the war was lost, so Hitler married Eva Braun on April 29. On April 30, Hitler was told that the Russians were a day from invading the Chancellery, the building above the Führerbunker. So, he and Eva both took cyanide tablets, and Hitler shot himself in the head. Their bodies were cremated by the remaining officers who were later discovered by the Russians. After the horrific and bloody Battle of Berlin, it wasn’t long until the German troops surrendered entirely. Around 80,000 Soviet troops, 100,000 German troops, and 175,000 civilians had been killed in the last two weeks of April. 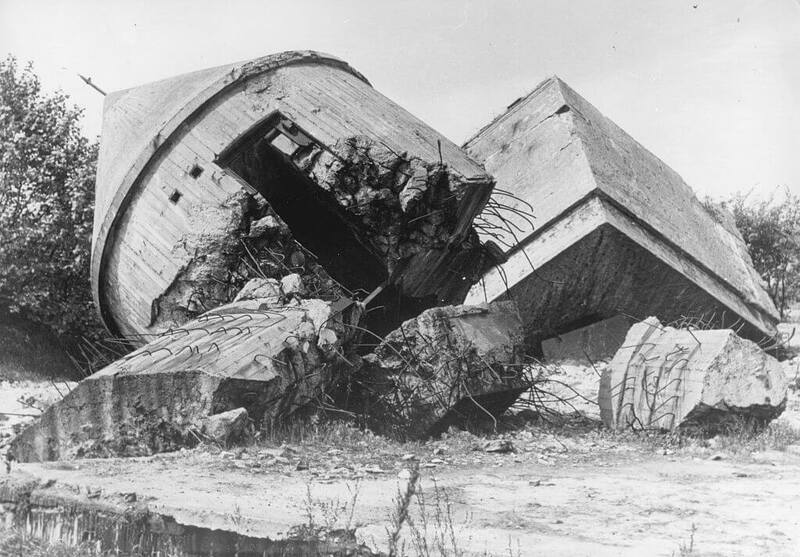 After the surrender of the Germans, the Russians began destroying all German buildings that were symbols of the Nazi regime. Eventually, they discovered Hitler’s bunker which was then vandalized and raided for memorabilia and goods. 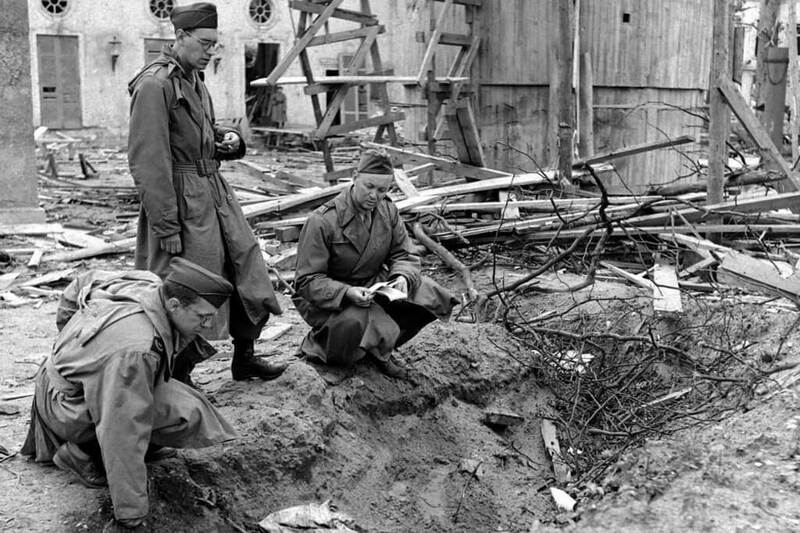 Two weeks after the fall of Berlin, photographer William Vandivert from Life became the first western man to photograph the remains of the Führerbunker. 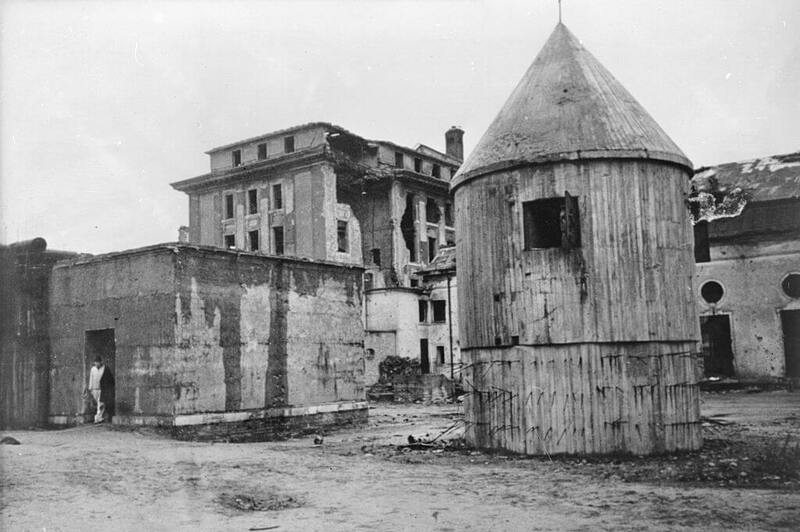 The photos taken by Wiliam Vandivert were taken two weeks after the Red Army forces had looted and destroyed much of the interior. 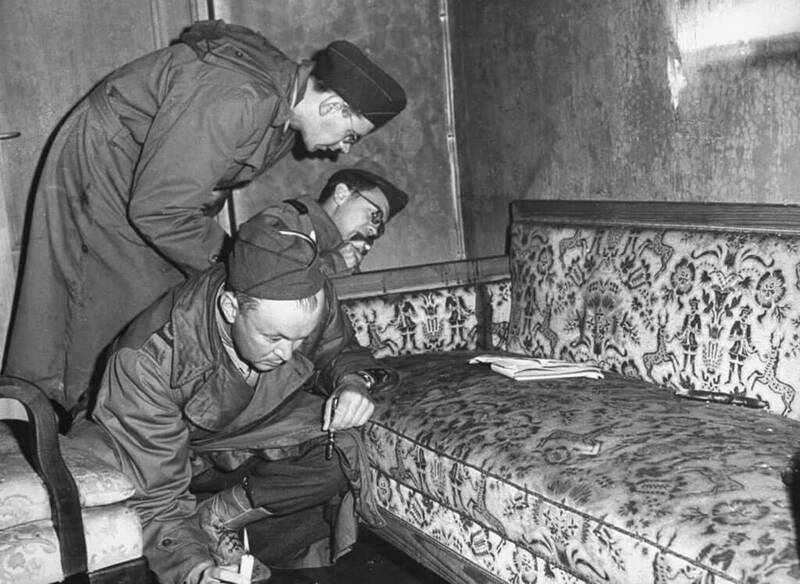 Here, we can see Russian war correspondents inspecting a blood-stained sofa. They had to rely on candles and other sources of light because most of the electricity in the bunker and all of Berlin was dead. 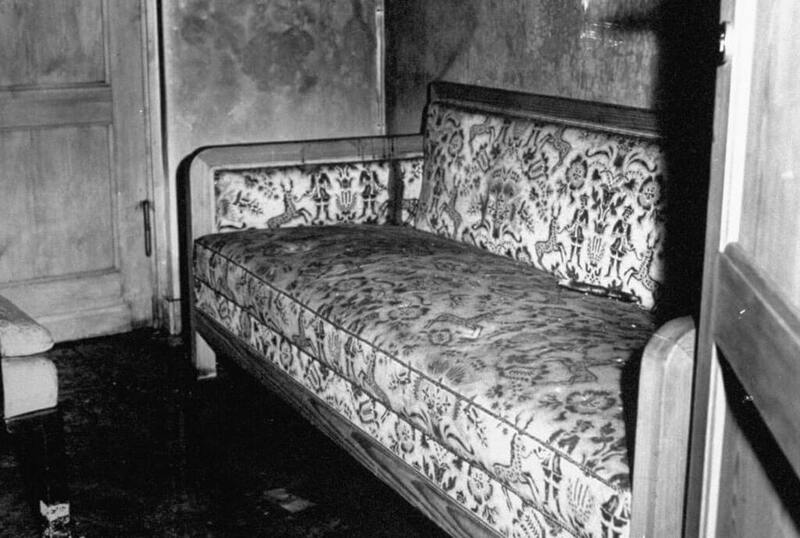 It has been assumed that the blood on the sofa was Hitler’s as he had shot himself while his wife had died from cyanide poisoning. It is known that the interior of the Führerbunker was decorated with extravagant art pieces hand-picked to Hitler’s liking. However, most of these art pieces were destroyed or looted during the raid with no consideration to where they may have come from or their significance. This painting left behind from the invasion was later realized to be a 16th-century painting that had been taken by the Nazi regime from a museum in Milan. This is one of the countless works of art that were taken by the Nazis from the 1930s until the end of the war. 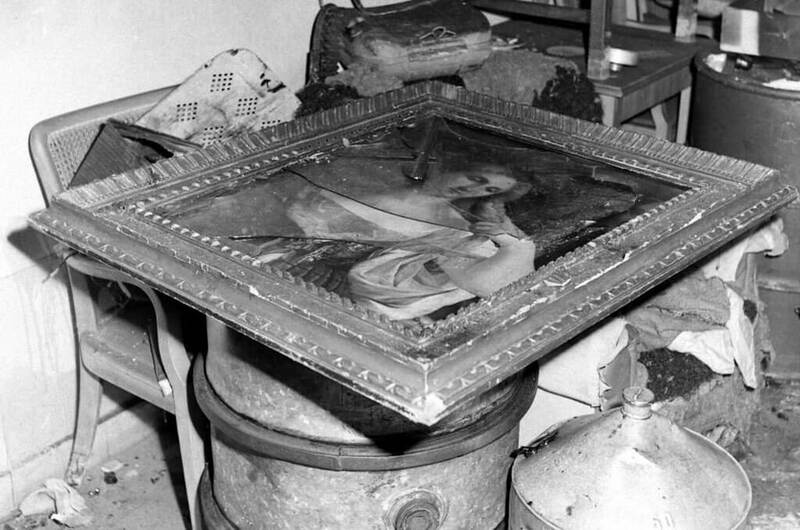 Founder of the Gestapo, Hermann Göring, had a personal collection of stolen art that numbered in the thousands. While Hitler’s accommodations inside of the Führerbunker may never have been ideal, they were still much nicer than the majority of the population in Berlin and the rest of war-torn Europe. They were big enough to house Hitler and Eva, as well as Joseph Goebbels, his wife, and six children who also killed themselves inside of the bunker. Here, we can see the full extent of destruction that occurred within the underground bunker. Very few things of worth or importance were untouched or left behind. 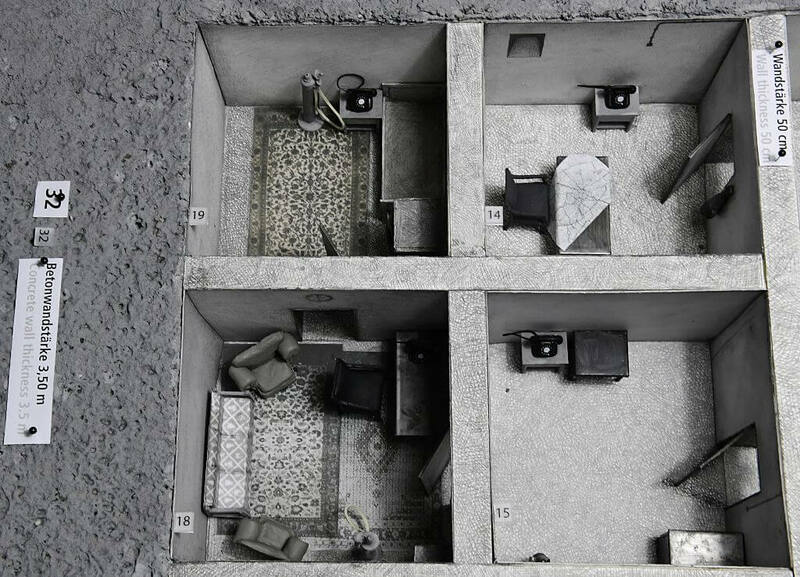 Only weeks after Hitler committed suicide, his bunker looked like every other part of Berlin. 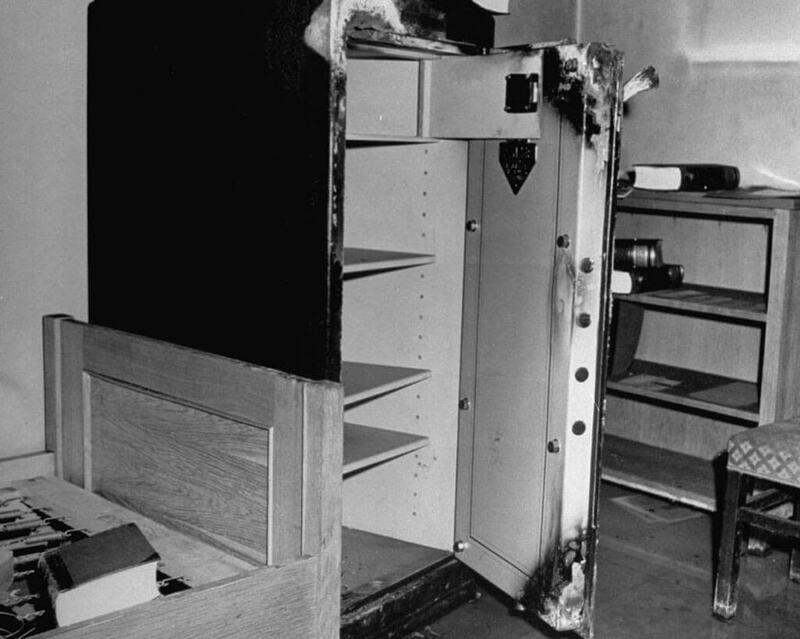 To further demonstrate the extent of the looting, Vandivert snapped a picture of this heavy safe that had been blown open to reach the contents. It’s still unknown what exactly was inside, whether it be personal documents, money, gold, jewels, or even war plans. However, whatever the contents were, they were taken from the bunker by the Russian soldiers. 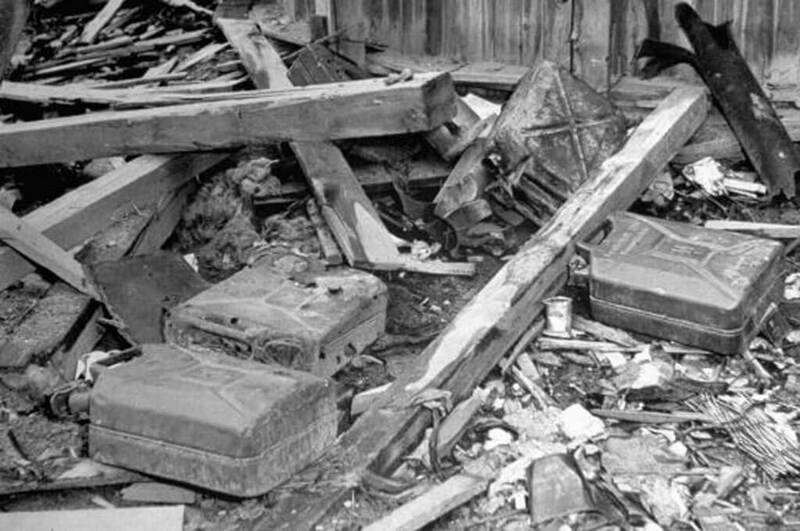 Most likely, some of the contents of the vault exist today and are serving as family heirlooms or are sitting on someone’s mantlepiece. Hitler and Eva weren’t the only people to take their lives in the bunker. 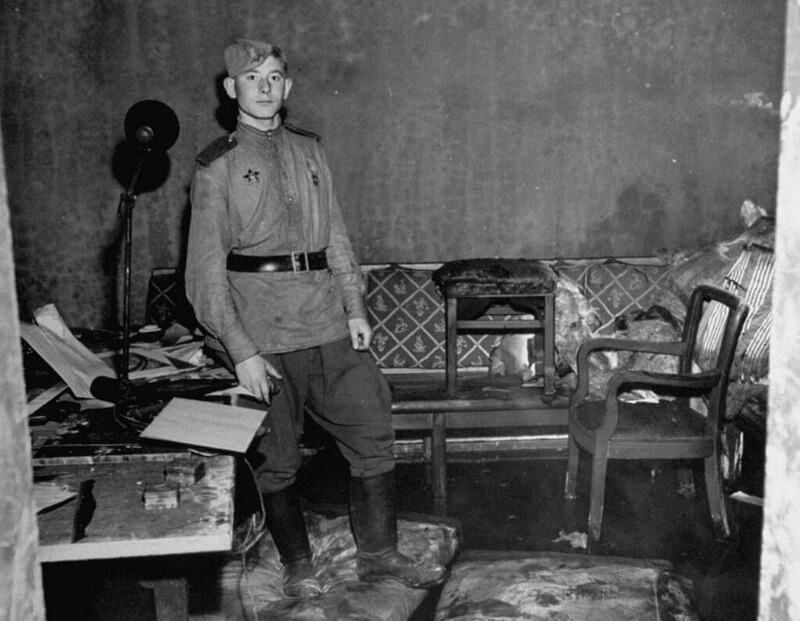 Here, a Russian soldier who still looks like a boy stands among the rubble that was once one of Hitler’s sitting rooms. Here, he would organize meetings, entertain guests, and even formulate battle plans. For the most part, everything has been destroyed, even the couches and furniture was torn apart and broken. This was most likely done in a frenzy of hatred and anger towards the Germans and notably Hitler who had been responsible for the travesties that occurred throughout Europe during the war. By the time that Hitler and Eva Braun were living in the bunker, it was clear that the end was near. During this time, Joseph Goebbels, who was the Nazi Minister of Propaganda, his wife, and six children moved in as well. Goebbels is credited with perpetuating the hatred of Jews in Europe and wanted to be close to his leader at the end. After Hitler committed suicide, the Goebbels killed their six children with morphine and cyanide and then killed themselves rather than surrendering to the Russians. The bunker was beginning to function as a place to die rather than survive. 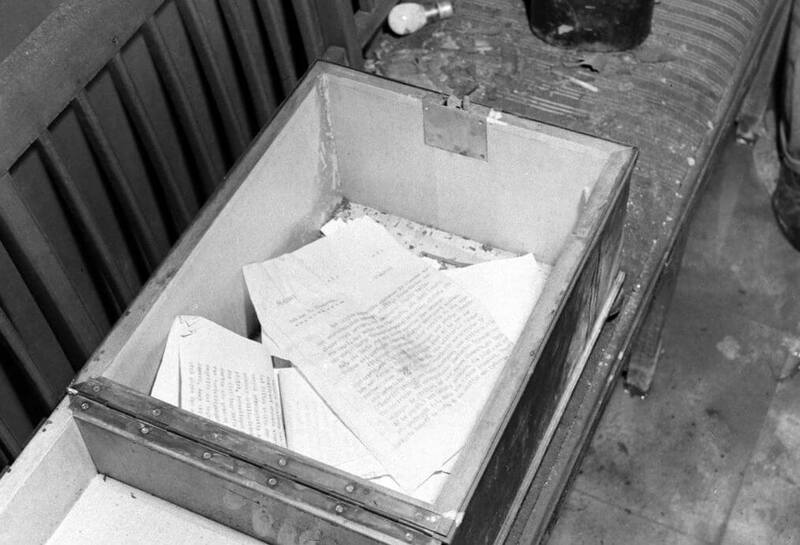 One of the few things actually left behind and intact in the bunker were numerous drawers filled with Nazi documents. Although these may seem too important to leave behind because they could contain valuable information, these pictures were taken weeks after the original raid. Almost immediately after Germany’s surrender, Soviet intelligence agents scoured the bunker looking for anything that might aid in ending the war as fast as possible. Everything that was left was mostly useless and not something that Soviet soldiers wanted to take for themselves. 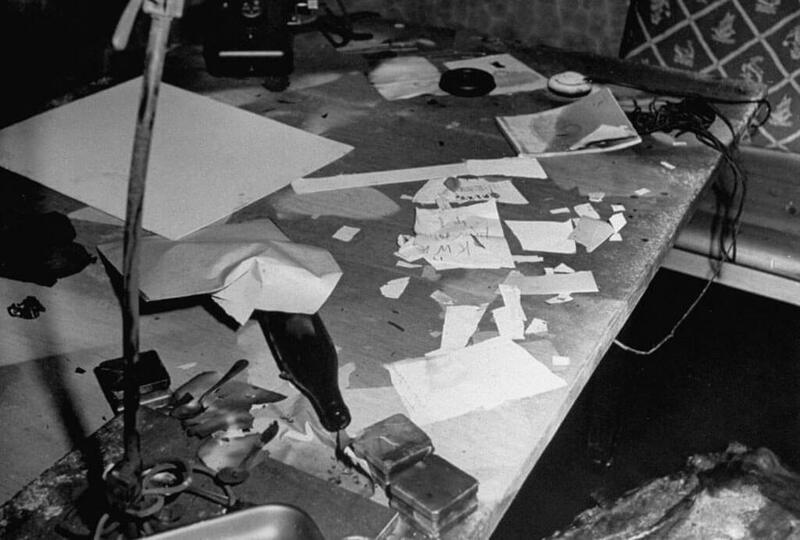 Bottles, scraps of paper, and trash litter this table in theFührerbunker. 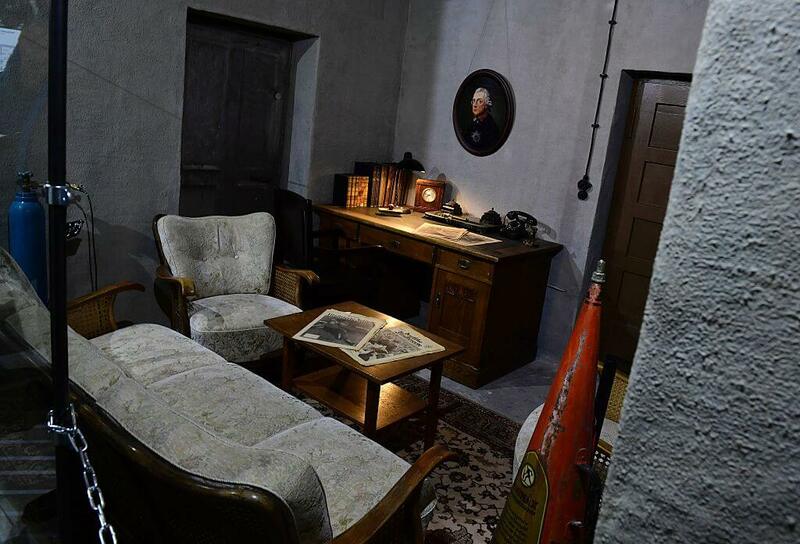 The table was once likely used to discuss tactics, battle plans, and other horrific actions carried out by the Germans. The state of the table is symbolic in the way that it was once a table where big decisions were made and high-up leaders gathered. Yet, now it is so useless that it was even left behind by the looters who took just about everything. Here, Time Correspondent Percy Knuth is crouching next to a ditch where the bodies of Hitler and Eva were burned after their suicide. What used to be the beautiful garden of the Reich Chancellery, is now nothing more than another battleground. The Chancellery has been destroyed yet the ditches where the bodies were put remains. According to British Historian Sor Antony James Beevor, the Soviets kept Hitler’s remains after the war and disposed of them in 1970 in secrecy. However, not knowing where the body lies has given birth to conspiracy theories about Hitler’s survival. Before Adolf Hitler committed suicide along with Eva, he instructed the remaining officers to burn their bodies. He wanted this done to make sure that his corpse couldn’t be displayed to the allies. As easy as that sounds, the major problem was that the officers didn’t have enough gasoline to get the job done. So, they had to siphon gas from damaged vehicles from the underground bunker’s garage. In the end, they managed to get around 200 liters to make sure that their bodies were unidentifiable. The charred remains were then buried in a shallow grave near the bunker. You won’t believe what the bunker looks like now. From the time that Hitler killed himself, it would only be seven more days until the Germans would officially surrender to the allies. This would lead to an end of the European conflict. 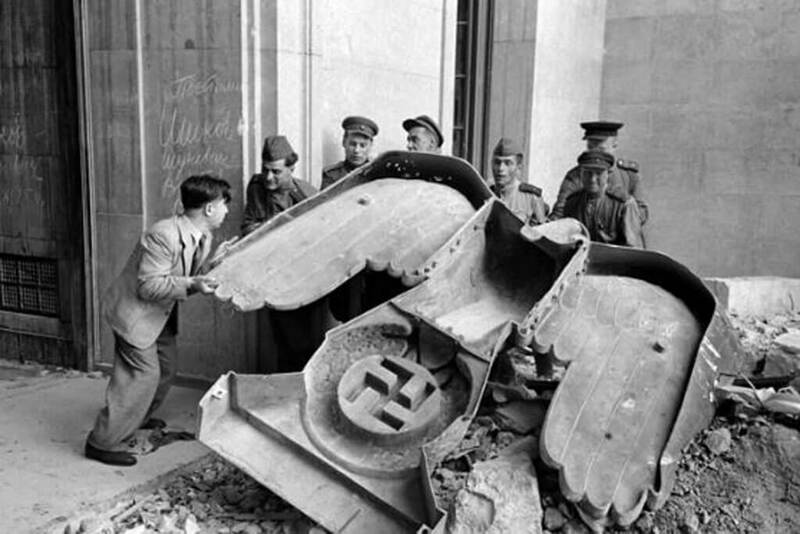 The image above features Russian soldiers and a civilian helping remove a large Nazi Party statue that was once above the doorway into the Riech Chancellery. It wouldn’t be long after this that the Riech Chancellery would be completely obliterated in an attempt to wipe the Nazi Regime from Europe entirely. During this time, all Nazi propaganda was destroyed in Berlin. This photo was taken by Vandivert near the bunker amidst the rubble of the city of Berlin. It perfectly captured the state of not just Europe, but the entire world. 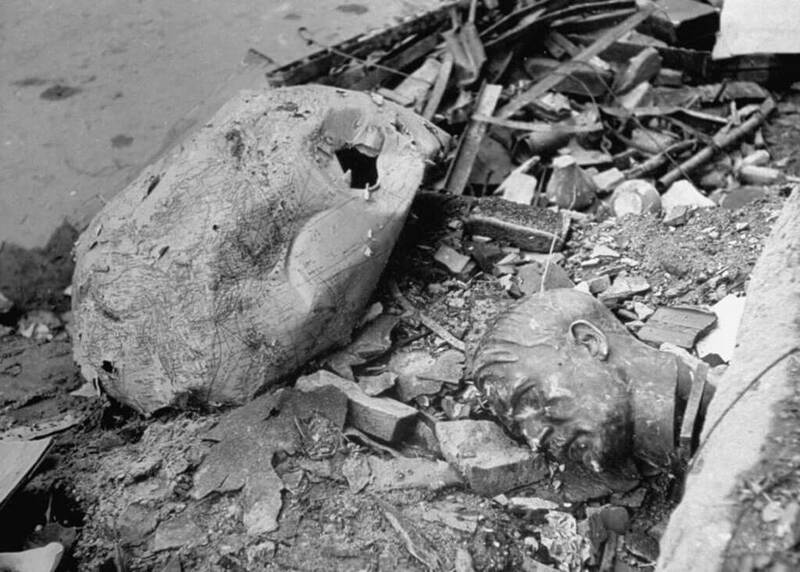 A fallen and broken statue of Hitler’s head lays next to a crumpled and burned globe. This image also sums up the state of Berlin at the time which was almost completely destroyed during the Battle of Berlin. There was extra devastation by the Soviets once they captured Berlin and ransacked the entire city. 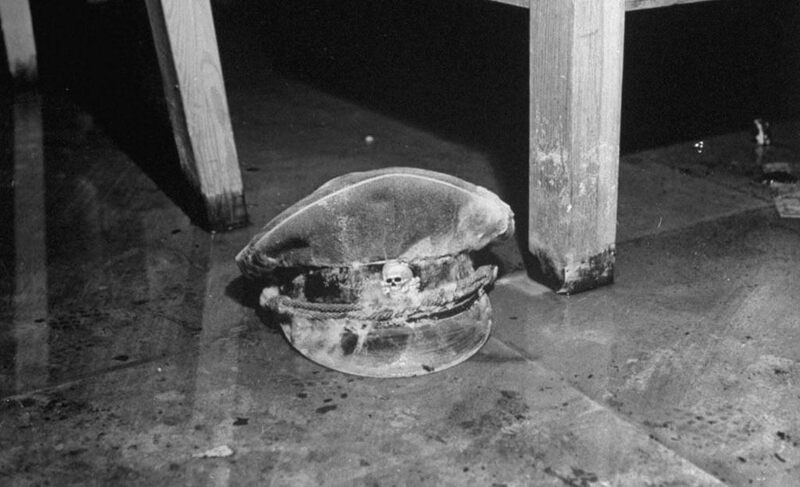 On the floor of the Führerbunker lies an SS cap marked with the death head insignia. For a decade the Schutzstaffel or “protection squadron” terrorized the people of Europe and became one of the most feared groups in the world. After the war, those involved in the SS who did not kill themselves first were hunted down, tried for war crimes, hanged, or jailed. Those in the SS who managed to evade the allies were usually executed by citizens who took matters into their own hands to deliver their own justice. Some SS even made deals with the Allies and their disturbing talents were later used in the upcoming Cold War. 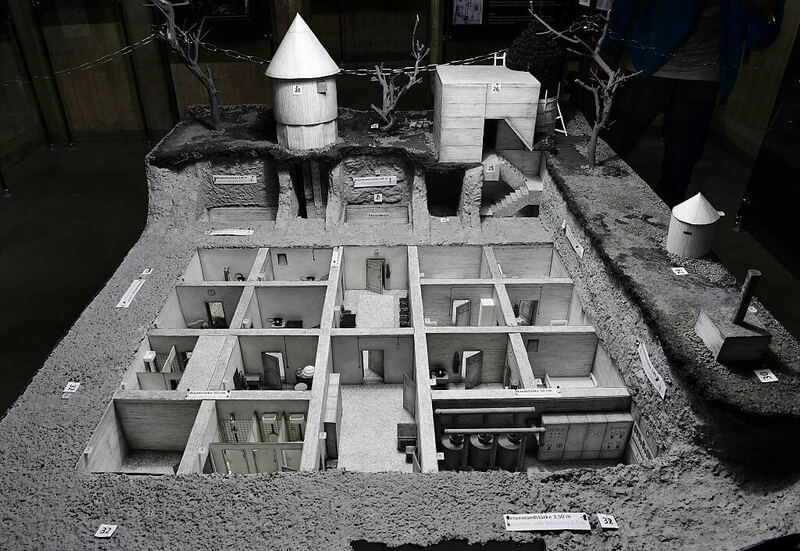 This model shows an overview of The Führerbunker. The Führerbunker was initially constructed as a temporary air-raid shelter for Hitler when he would occasionally visit the capital of Germany. 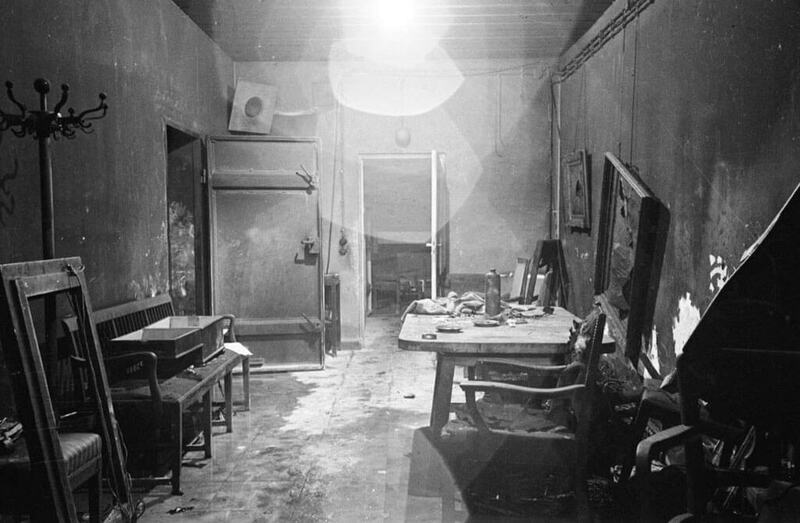 After the bombings had increased in Berlin, the bunker was expanded from a temporary shelter into a permanent one. As you can see, the complex had two separate shelters. The Vorbunker or “upper bunker” built in 1936, and the Führerbunker, located underneath the Vorbunker which was completed in 1944. The Führerbunker was not only further underground than the Vorbunker, but it was also much more reinforced. Hitler took up residence in the Führerbunker, the safest part of the complex. See how the conditions inside the Führerbunker were less than optimal. Although the Führerbunker was transformed into a residence for Hitler himself, it didn’t mean that the conditions were the best possible. Even though the bunker was self-contained, it was underneath a water table, which made the entire complex damp. To keep moisture out, there were pumps running non-stop to remove groundwater. Water for the bunker was pumped in from a well and electricity was provided by a diesel generator. Communications to the outside world were a telex, telephone switchboard, and an army radio. By the end of the war, Hitler was relying on BBC radio broadcasts for most of his information. After the war, there were numerous attempts to destroy the bunker entirely with little success. Then in 1959, the East German government began a series of demolitions on both the Chancellery and the bunker. However, the land remained undeveloped between 1988 and 1989 because it was too close to the Berlin Wall. Then, during the construction of residential housing in the area, parts of the Chancellery and bunker were rediscovered and filled in. 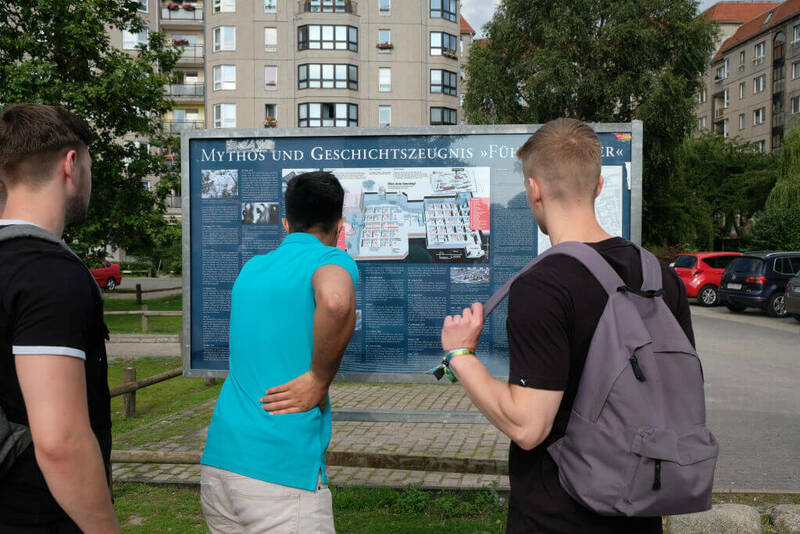 In 2006, an information board was installed at the location of the Führerbunker with an illustration of the layout and history of the bunker.